After Houthis target Saudi cities, coalition forces say they 'crossed a red line' and will pay dearly. Home destroyed in Saudi bombing, Sanaa. Brigadier General Ahmed Asseri, spokesman for the Saudi-led coalition fighting the Iran-backed Houthis in Yemen, said the Houthis had “changed the equation” by targeting Saudi cities in recent days, and vowed that the coalition would go after leaders of the rebel group. "The Houthis are now targeting the borders of the kingdom and the situation is that we will defend our citizens," Asseri told Reuters. He said that 15 people were wounded when Houthis shelled the city of Najran Thursday evening. "Coalition forces will deliver a harsh response starting this moment, so that those who carried out this operation will pay the price," he said earlier on Saudi state television. "The equation is different, the confrontation is different, and they will pay a harsh and expensive price," he told reporters. "The safety of Saudi Arabia is a top priority for the coalition and the Saudi armed forces. It is a red line they crossed." 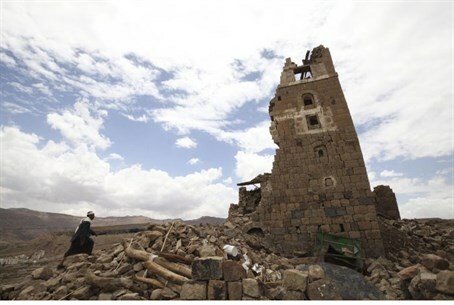 Asseri's comments came hours after Saudi Foreign Minister Adel al-Jubeir proposed a five-day ceasefire in the fighting to enable humanitarian aid to civilians, on the condition that the Houthis also halt the fighting. Jubeir made the announcement at a news conference with US Secretary of State John Kerry. "There will be a ceasefire everywhere, or there will be ceasefire nowhere," Jubeir said. Kerry welcomed the proposal, calling on the Houthis and their supporters "use all their influence not to miss this opporunity to find a peaceful way forward." He added that the ceasefire could be "renewable" if the fighting halts. In response to Yemen's UN ambassador's plea to deploy ground troops, Kerry said "neither the US nor Saudis are talking about sending ground troops to Yemen."